Cupcakes are a staple in our house. Everyone loves a treat and for some reason I have the logic that homemade cupcakes are much better for you then shop bought cakes. "Make, Bake, Cupcake" takes this logic to a whole new level. 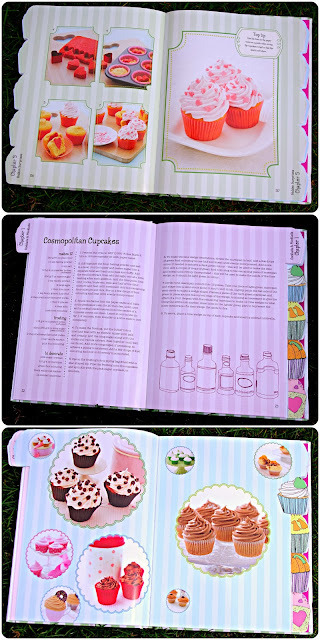 With the first chapter entitled "Cocktails and Mocktails" this book takes my cupcake making exploits to a whole new level. And the book has great balance, the scary cute section is providing lots of motivation for our Halloween party, we are especially loving the ghost cupcakes. Squeaks has fallen head over heels for the 'heart in a cupcake'- and they do look a lot of fun. And me, I love all the hints and tips at the beginning, and I do love how easy to follow the recipes are, making the cocktail cupcakes so straightforward, although with my baking record I would guess Limoncello cupcakes will be my temptation. With something for everyone this is a great book to get creativity flowing. I love the ideas, the presentation, and the ideas for not only great flavours but also great presentation. Disclosure: We received a copy of this book to review as part of our role as a Parragon Book Buddy. All views contained are our own. looks like a lovely book...lots of pictures which I like in a cook book!